My daughter, Sara Williams (Tweaks and Designs), designed my new blog for a Mother's Day Gift!!! ISN'T IT GORGEOUS!! I love the colors, flowers, and little birds. She was so creative (as usual) with the fonts, design and all of it!! I was secretly hoping that she'd do this for Mother's Day for me (we certainly do think alike) and hurray SHE DID!! I made this card trying to use the same mum images and same colors to introduce the opening of my new blog!! I had ordered from Lizzie Anne the Garden Inspirations set (having seen a preview of what was going on the blog) so that I could use it on the first card going on the new site. I used Sage Shadow from Stampin' Up as the base color. The polka dot decorative paper is from Papertrey's Polka Dot Parade and the small floral under it was a freebie from Lizzie Anne that came with the stamp set. I mounted the two dp's were mounted on Blush Blossom (Stampin' Up). I used SU's Scallop Circle Punch for the large flower (colored with Copics). The leafy stem was colored with Stampin' Up's Sage Shadow and cut by hand. I punched the flowers from Blush Blossom using STU's Three for You punch box. Cat's Eye shading was used on all of the edges and 3-D Paint in tan was used as the centers of the small punch flowers. Dashes, Dots & Checks ribbons from Michael's accents the dp strip. 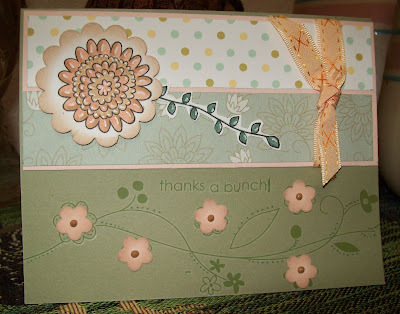 I love this card and think it is such a compliment to MY NEW BLOG!! I hope you like it and the blog design. I forgot to tell you...Eddison was watching me work on your design and LOVED it A LOT!!!! I think he recognized your picture...or maybe he like the design too! :D Every time I had the sample blog open he would point and look and make his crazy back of the throat rattle/laugh noise. He was babbling too and I SWEAR he said AMMAAAH!!!! Sara, That was so nice of you to think of your Mom with a new blogface. It's real cute and I bet she loves it !! Happy Mother's Day, Linda!!! Your blog is GORGEOUS -- just like you! And I love your sweet card, too!!! Linda, I love your new blog! I have not ventured into the blogging world yet, but who knows, maybe someday...LOL! Loos great! Happy Mother's Day- it's evident where Sara gets her talent from! Congratulations on your grand opening!!! beautiful blog design..... nice give for Mother's Day too!! Nice work on the cards, you are very talented!!! ooh!! i now see it on my own computer and it looks fabulous!! totally YOU!! what a talented sister i have!!! heehee!!! That was just wonderful! Your new design is fantastic and I love your matching card!! Happy Mother's Day! I keep coming back to see the card with the blog...HAHAHA! They are so purdy together!